OK, so you have seen her incredible tea parties here and here and even co-hosted this amazing one here. You know of her being the most frugal designer I know. 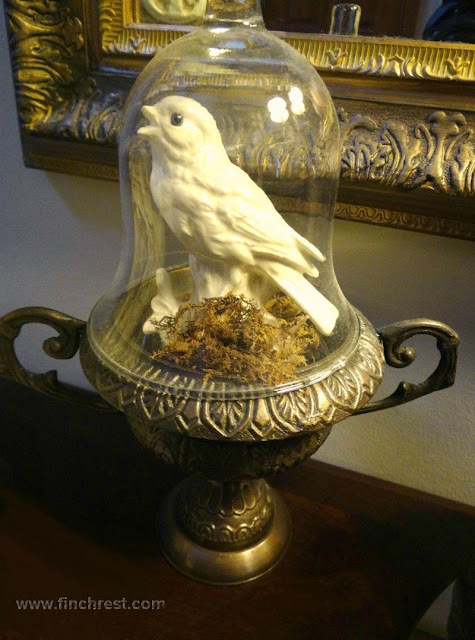 so today I share just a little taste of her love of bird decor. Be still, my heart! This gal loves pretty bird stuff! 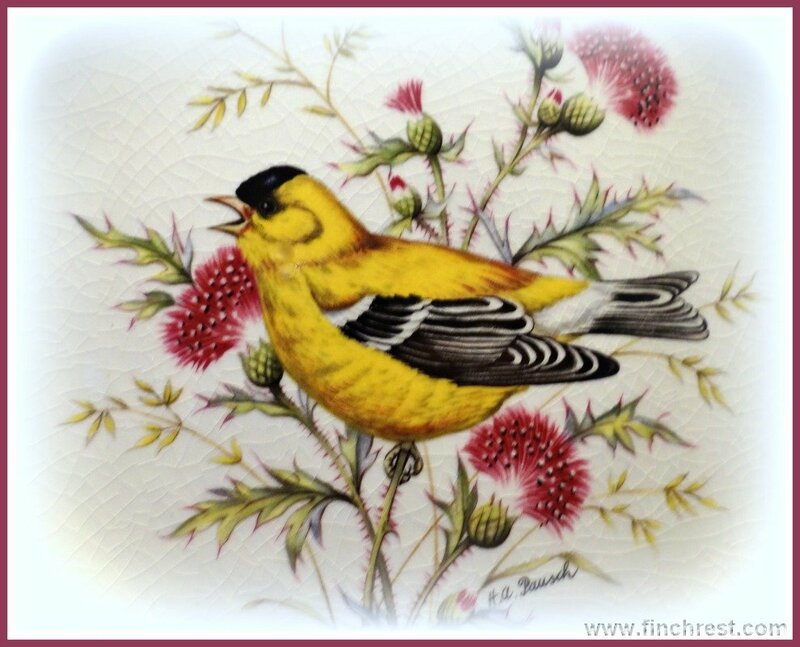 Let's start with one of her best hand painted and signed bird plates. Yes, yes, that's a pretty yellow finch. Sigh. I absolutely love this lady and her bird fetish stuff! sisters in BIRDS as well!!?!??? This has birds and kitty and Mary. She realllllly misses her sweet kitty. Romeo says get a rescue kitty, MD, because they're awesome. Let's get back to All Things Bird and stay the course, shall we? The Queen of Tasteful Bird Design! Oh, and she throws in Fleur de Lis too, touches here and there. I would love to win the lottery and send her to France for a nice visit. and it just turned into a mini Versailles post, haha. just in her living room, to show you what I mean! one will find nifty bird things. She works in seasons and holidays too! feel most comfortable in my Aviary guest room, don't you? Wow...everything is so pretty! I love birds, too. I'd really like to do a "natural" Christmas tree with birds and birdnests, etc. Thank you for stopping by and the support! How is Romeo doing?? very beautiful indeed. Bird decor is one of my favorites. Delightful post! The birds are beautiful. Love all of Mary D's bird stuff, she is very talented with birds and Tea! Yes, definitely birds of a feather and I didn't show half of my stuff. 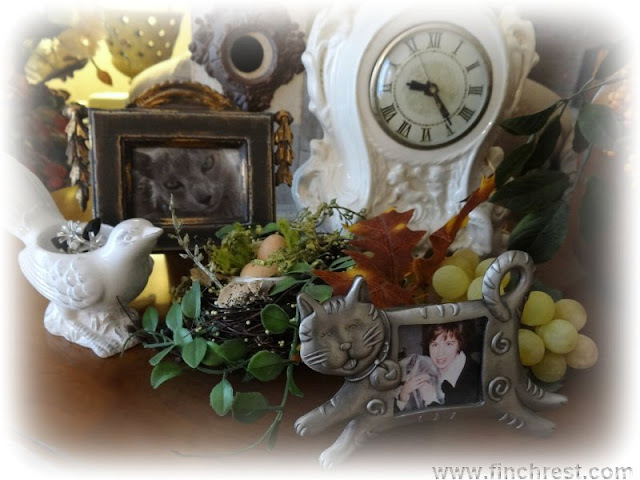 Cute kitty frame that Mary has and I like all of her feathered friends decor. You are blessed to have such a wonderful friend. Such beautiful things in her home, Michele. 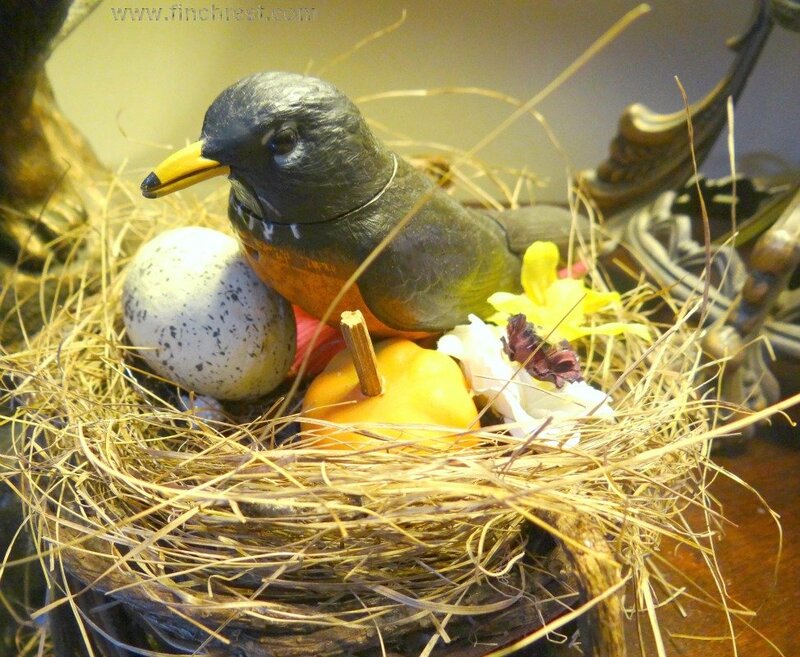 If I went around and counted how many birds or nest things I have decorated with, I'm sure I'd be surprised. I did that one year with clocks and snowmen, at Christmas, and couldn't believe how many I had. Because they were all spread out throughout the house I just never realized. I love bird things...nests, eggs, houses, and birds themselves. Your friend Mary has a delightful collection and, yes, I'm sure that she would feel right at home in your guest room. I also have several bird figurines. Thanks for sharing your friends great collection. 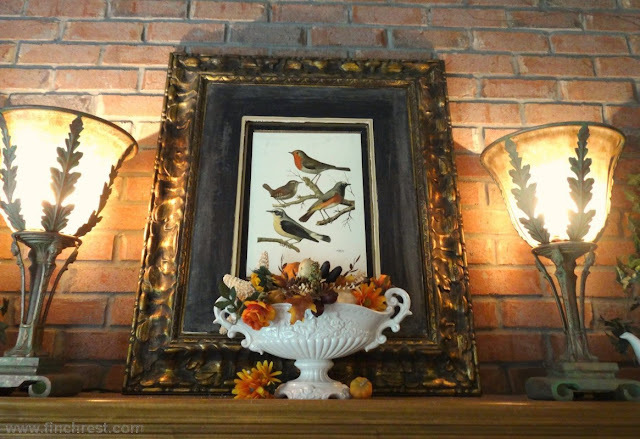 All the birdie decor is so pretty, Michele! 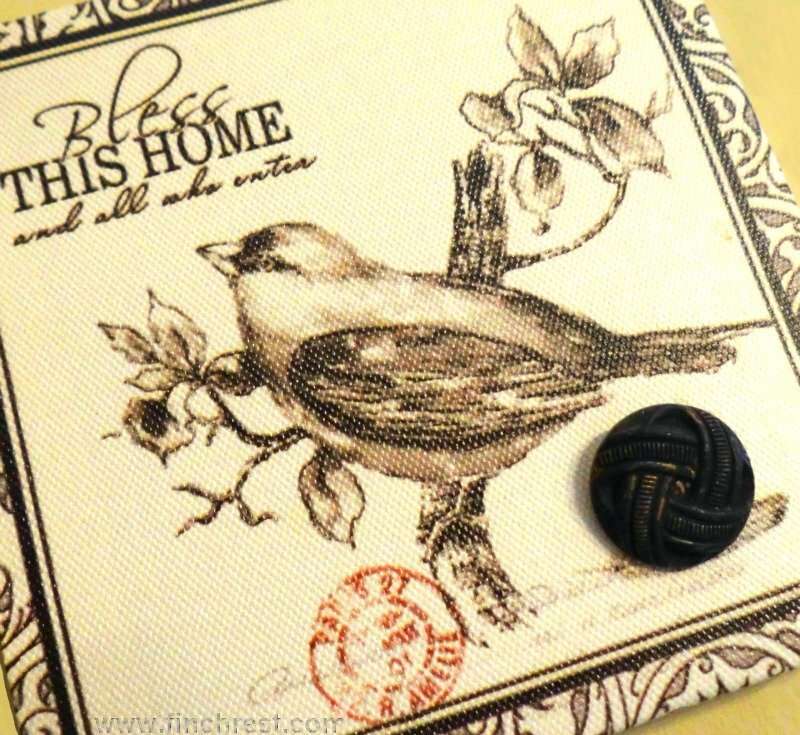 I think there are a lot of us out there who have a 'thing' for our little feathered friends! I have birdies all over my home too. My son is studying Wildlife Conservation Tech. and we are having the most interesting conversations these days. He brought me home a wee bird's nest the other day that he had found out in the field. 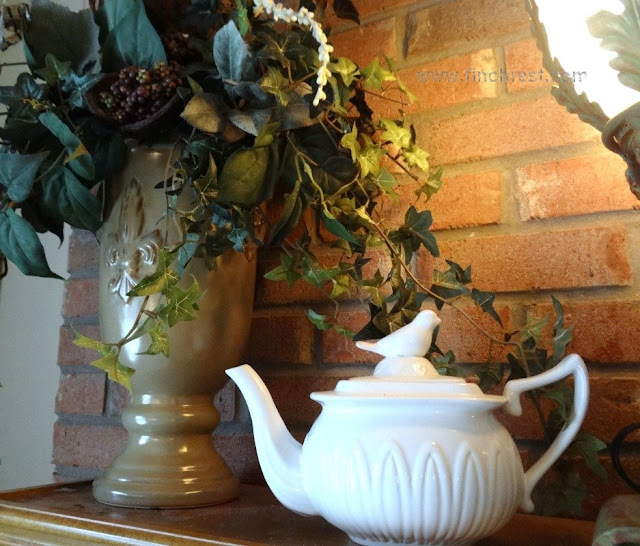 I love your friend's teapot with the birdie perched on top! Loved this post, Michele. Have a delightful weekend, my friend. Great post. A real treat for the eyes, as I loved all the pictures! !